Use RSS Feeds and have news delivered right to your Outlook mailbox. If you’re still getting your news in paper-based formats you probably prefer it delivered right to your doorstep. Electronically speaking, you can get that same at-home delivery service of your preferred e-News by using RSS Feeds. RSS (Real Simple Subscription) feeds are easy to create and afford you the luxury of not having to step out of your Outlook mailbox to scan the headlines of the day. Locate the RSS address of your favorite news site. This can often be found by typing ‘RSS’ in the search field of that site’s home or landing page. RIGHT + CLICK on the RSS Feed you wish to subscribe to and select appropriate copy command (e.g., Internet Explorer users select Copy Shortcut. Chrome users select Copy Hyperlink). In the Outlook Navigation pane, RIGHT + CLICK on the RSS Feeds folder, and select Add New RSS Feed. The New RSS Feed dialog will appear. In the provided field press CTRL + V to paste the previously copied link, then press Add. 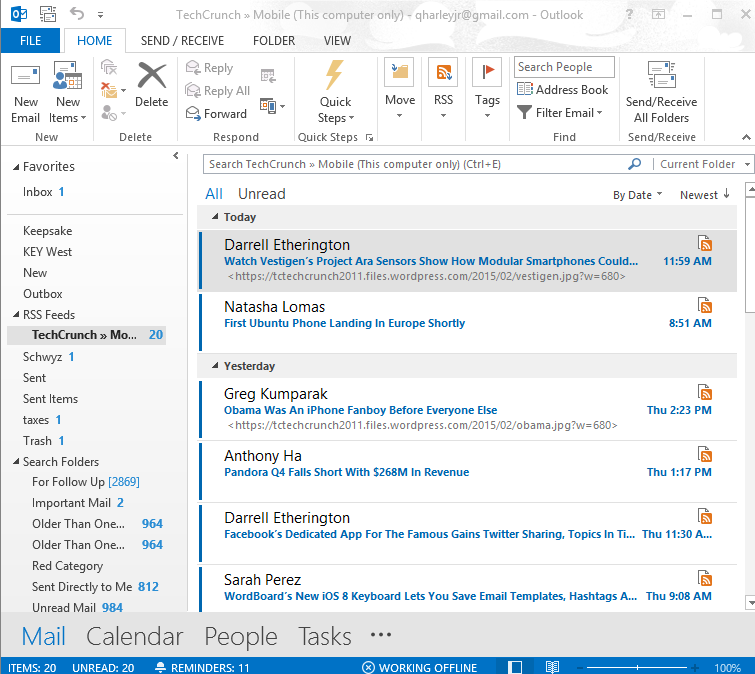 A Microsoft Outlook: Add this RSS Feed to Outlook dialog will appear. Note: Optionally, you can modify options (i.e., rename feed, download full article, etc) by pressing the Advanced button.